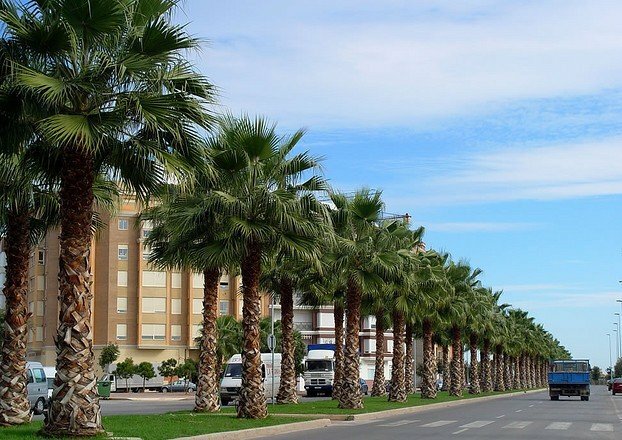 Washingtonia or the Mexican Palm is one of the favorite palms of landscape designer for its ornamrntal fronds and ability to grow in poor growing conditions. Native of desert mountain valleys and canyons of Mexico and North America, Washingtonia grows under sunny conditions and grows easily in poor, sandy soil. It can withstand spells of drought and thus makes a good choice for xeriscape projects. The genus is represented by two species: Washingtonia Robusta or Mexican Fan Palm and Washingtonia Filifera or California Fan Palm. The former is more popular as ornamental tree and has been hybridized and domesticated in almost all tropical regions of the world. Typically, Washingtonia Robusta can grow up to 100 feet though it takes quite a long time to attain that height. The plant is covered by the crown of large glossy-green and fan-shaped fronds that grow symmetrically around a tall, slender trunk. The solitary trunk of the plant bulges near the ground but continues to grow as slender trunk towards the crown. Mature trees produce attractive blooms followed by small edible fruits. Washingtonia Robusta can be used as a versatile ornamental plant in landscapes as well as small gardens. Young plants can be grown in containers as nice foliage plants for patios. Larger plants can be grown in open landscape projects where they can stay for decades and grow in to skyscraper-trees. They also serve as ornamental trees along streets or pathways. Both species are grown from seeds. Though these plants grow without much care, however, a balanced and well-drained soil with regular watering really helps them flourish quickly.